The lake system within the Valley of Mexico at the time of the Spanish Conquest, showing distribution of the chinampas. Chinampa (Nahuatl: chināmitl [tʃiˈnaːmitɬ]) is a type of Mesoamerican agriculture which used small, rectangular areas of fertile arable land to grow crops on the shallow lake beds in the Valley of Mexico. Chinampas were created by the freshwater shoreline of the Northern portion of the central lake system of Mexico by the Nahua peoples, commonly called the Aztecs. Sometimes erroneously referred to as "floating gardens", chinampas are artificial islands that were created by building up extensions of soil into bodies of water. Evidence from Nahuatl wills from late sixteenth-century Pueblo Culhuacán suggests chinampas were measured in matl (one matl=1.67 meters), often listed in groups of seven. One scholar has calculated the size of chinampas using Codex Vergara as a source, finding that they usually measured roughly 30 m × 2.5 m (98.4 ft × 8.2 ft). In Tenochtitlan, the chinampas ranged from 300 ft × 15 ft (91.4 m × 4.6 m) to 300 ft × 30 ft (91.4 m × 9.1 m) They were created by staking out the shallow lake bed and then fencing in the rectangle with wattle. The fenced-off area was then layered with mud, lake sediment, and decaying vegetation, eventually bringing it above the level of the lake. Often trees such as āhuexōtl [aːˈweːʃoːt͡ɬ] (Salix bonplandiana) (a willow) and āhuēhuētl [aːˈweːweːt͡ɬ] (Taxodium mucronatum) (a cypress) were planted at the corners to secure the chinampa. In some places, the long raised beds had ditches in between them, giving plants continuous access to water and making crops grown there independent of rainfall. Chinampas were separated by channels wide enough for a canoe to pass. These raised, well-watered beds had very high crop yields with up to 7 harvests a year. Chinampas were commonly used in pre-colonial Mexico and Central America. There is evidence that the Nahua settlement of Culhuacan, on the south side of the Ixtapalapa peninsula that divided Lake Texcoco from Lake Xochimilco, constructed the first chinampas in C.E. 1100. The earliest fields that have been securely dated are from the Middle Postclassic period, 1150 – 1350 CE. Chinampas were used primarily in Lakes Xochimilco and Chalco near the springs that lined the south shore of those lakes. The Aztecs not only conducted military campaigns to obtain control over these regions but, according to some researchers, undertook significant state-led efforts to increase their extent. 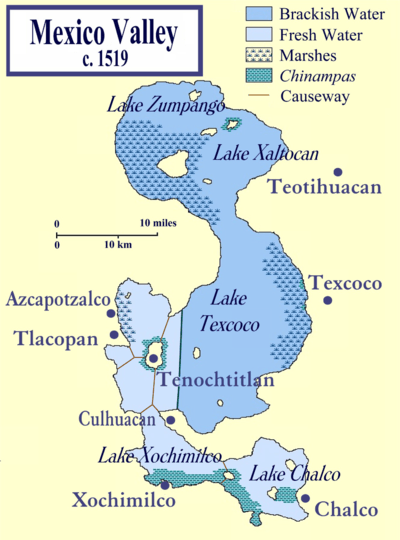 Chinampa farms also ringed Tenochtitlán, the Aztec capital, which was considerably enlarged over time. Smaller-scale farms have also been identified near the island-city of Xaltocan and on the east side of Lake Texcoco. With the destruction of the dams and sluice gates during the Spanish conquest of Mexico, many chinampas fields were abandoned. However, many lakeshore towns retained their chinampas through the end of the colonial era since cultivation was highly labor-intensive and less attractive for Spaniards to acquire. 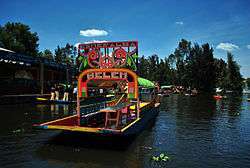 Xochimilco still retains a few chinampas, but in the modern era is mainly a tourist attraction. Among the crops grown on chinampas were maize, beans, squash, amaranth, tomatoes, chili peppers, and flowers. Maize was planted with digging stick huictli [wikt͡ɬi] with a wooden blade on one end. Chinampas were fertilized using lake sediments, likely Night soil as well, along with nutrient rich earth from the bottom of lakes. There has been scholarly work on terminology for soils and land formations. The word chinampa comes from the Nahuatl word chināmitl, meaning "square made of canes" and the Nahuatl locative, "pan." In documentation by Spaniards, they used the word camellones, "ridges between the rows." However, Franciscan Fray Juan de Torquemada described them with the Nahua term, chinampa, saying "without much trouble [the Indians] plant and harvest their maize and greens, for all over there are ridges called chinampas; these were strips built above water and surrounded by ditches, which obviates watering." Chinampas are depicted in pictorial Aztec codices, including Codex Vergara, Codex Santa María Asunción, the so-called Uppsala Map, the Maguey Plan (from Azcapotzalco) In alphabetic Nahuatl documentation, The Testaments of Culhuacan from the late sixteenth century have numerous references to chinampas as property that individuals bequeathed to their heirs in written wills. ↑ Robert C. West and Pedro Armillas, "Las chinampas de México" Cuadernos Mexicanos (1950) 40:165-82. 1 2 Jeanne X. Kasperson, ed. (1995). "Chapter 7: The basin of Mexico". the basin of mexico Regions at risk: Comparisons of Threatened Environments Check |url= value (help). United Nations University Press. ISBN 978-92-808-0848-3. ↑ Cline, Colonial Culhuacan, pp. 134-35. 1 2 3 Jorge, M et al. (2011). Mathematical accuracy of Aztec land surveys assessed from records in the Codex Vergara. PNAS: University of Michigan. ↑ "Taxodium mucronatum". The Gymnosperm Database. Archived from the original on 2010-01-09. Retrieved 2009-10-12. ↑ Cline, Colonial Culhuacan p. 2. ↑ Richard Blanton, "Prehispanic Settlement Patterns of the Ixtapalapa Peninsula Region, Mexico." Ph.D. dissertation, University of Michigan 1970. ↑ Edward E. Calnek, "Settlement Pattern and Chinampa Agriculture," American Antiquity 1972, 37(104-15). ↑ Edward E. Calnek, "The Organization of Urban Food Supply Systems: The Case of Tenochtitlan" in Las ciudades de América Latina y sus áreas de influencia a través de la historia, Jorge Hardoy and Richard P. Schaedel, eds. Buenos Aires: Sociedad Interamericana de Planificación 1975. ↑ Edward E. Calnek, "El sistema de mercado de Tenochtitlan," in Política e ideología en el México prehispánico," Pedro Carrasco and Johanna Broda, eds. Mexico: Editorial Nueva Imagen, 1978, pp. 97-114. ↑ Jeffrey R. Parsons, "The Role of Chinampa Agriculture in the Food Supply of Aztec Tenochtitlan," in Cultural Change and Continuity, Charles Clelland, editor. New York: Academic Press 1976, 242. ↑ Van Tuerenhout, Dirk R. (2005). The Aztecs: New Perspectives, p. 106. ABC-CLIO, Inc.
↑ Pedro Armillas, "Mesoamerica" in A History of Land Use in Arid Regions, L. Dudley Stamp, ed. Paris: UNESCO 1961, 266-67. ↑ Barbara J. Williams, "Aztec Soil Science," Boletín Instituto de Geografía 1976, 6:115-20. ↑ Cline, Colonial Culhuacan, p. 132. ↑ Juan de Torquemada, Monarquia Indiana, vol. 2, 483. Mexico: Editorial Porrúa 1975. ↑ Sigvald Linné, El valle y la ciudad de México en 1550. Relación histórico fundada sobre un mapa geográfico, que se conserva en la biblioteca de la Universidad de Uppsala [Sweden]. Stockholm 1948. ↑ Edward E. Calnek, "The Localization of the 16th-century Map Called the Maguey Plan," American Antiquity 1973 37(1)104-15. ↑ S.L. Cline and Miguel León-Portilla, The Testaments of Culhuacan UCLA Latin American Center, Nahuatl Studies Series, vol. 1 1984. ↑ Mac Chapin, "The Seduction of Models: Chinampa agriculture in Mexico," Grassroots Development: Journal of the Inter-American Foundation, volume 12, no. 1, (1988) pp. 8-17. Blanton, Richard. "Prehispanic Settlement Patterns of the Ixtapalapa Peninsula Region, Mexico." Ph.D. dissertation, University of Michigan 1970. Calnek, Edward E., "Settlement Pattern and Chinampa Agriculture," American Antiquity 1972, 37(104-15). Chapin, Mac. "The seduction of models: Chinampa agriculture in Mexico," Grassroots Development: Journal of the Inter-American Foundation Volume 12, no. 1, 1988, pp. 8–17. Cline, S.L., Colonial Culhuacan, 1580-1600: A Social History of an Aztec Town. Albuquerque: University of New Mexico Press 1986. Ezcurra, E. De las chinampas a la megalópolis: El medio ambiente en la Cuenca de México. Mexico City, SEP 1991. Popper, Virginia. "Investigating Chinampa Farming." Backdirt (Cotsen Institute of Archaeology). Fall/Winter 2000. Wikimedia Commons has media related to Chinampas. 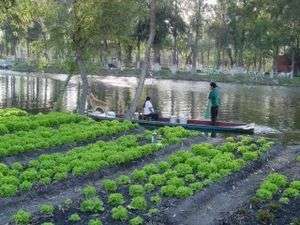 Chinampas 2.0 – an Elegant Technology From the Past to Save the Future. Rodrigo Laado. Permaculture Research Institute of Australia. May 28, 2013. Chinampas Gardens. Brianna. Midwest Permaculture. December 6, 2012.